Wells Gray Park and Clearwater has an extensive network of groomed cross-country ski trails. Trails are groomed for both skate and classic skiing. 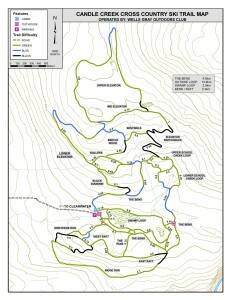 When conditions are ideal there can be up to 85km of ski trails. In addition there are also adventure touring opportunities. The Wells Gray Outdoors Club maintains the Candle Creek cross country skiing trails, an area located 10 minutes from the Wells Gray Information Centre. Here you will find about 25km of well-groomed classic and skate trails, suitable for both beginner and more advanced skiers. Note that dogs are not allowed on these trails. The Outdoors Club has built a warming-cabin which is open for trail users. There is a nominal fee for trail-use of $10 per visit which goes towards grooming costs, which can be deposited in the ‘honour-box’ at the trail-head. Members of the Wells Gray Outdoors club do not need to pay this. North Thompson River Provincial Park also offers a groomed ski track, and dogs on leash are welcome. To get there, drive 5 km South from the Information Centre on Yellowhead Highway 5, and you will see a sign on the left. There are a few ski systems in the park. The first is The Murtle River Nordic trails, which are located along the Murtle River. To reach them, drive about 40km along the Clearwater Valley Road from the Wells Gray/Clearwater Information Centre, just shy of the Dawson Falls car park; follow the signs for “Majerus Farm”. A warming hut is provided just in front of the parking area. Only 1-2km along the trail, you will encounter the remains of the Majerus Farmhouse, a historical area dating back to the pioneer period of the Wells Gray Area. 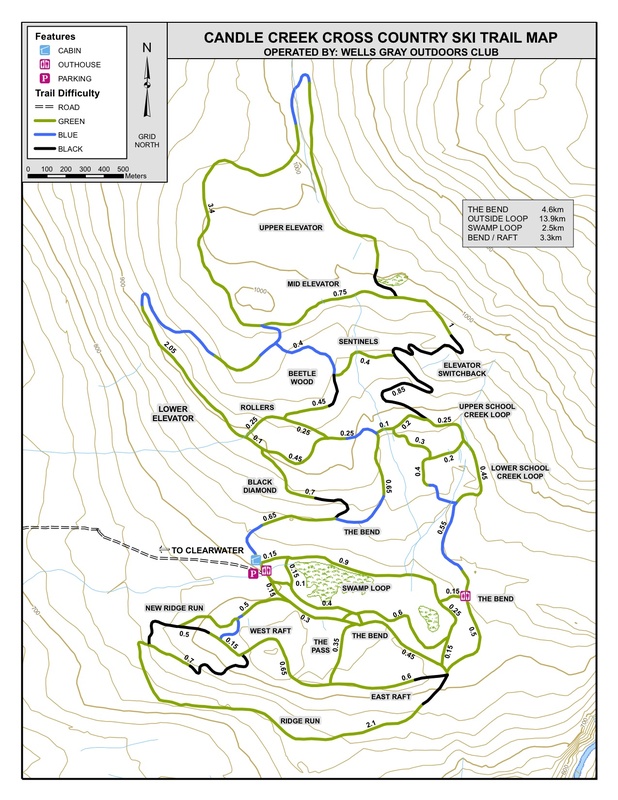 The Murtle River trail is well mapped, and each major intersection has a map showing where you are and where you can go, with distances marked. This area also provides access to the MacLeod Hill and Stillwater trails, as well as the Blackwater trail, which descends over about 10km to Helmcken Falls Lodge. The King Warming Hut is located approximately 5km from the parking area along the River Trail. The trails in the Green Mountain area are often utilized in the winter for cross country skiing, but be aware that the road is steep in some areas.